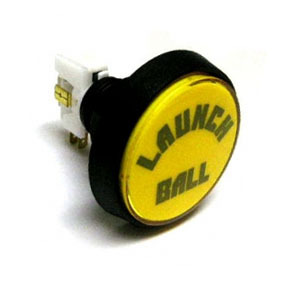 Large illuminated LAUNCH BALL button as used on many later-model Bally and Williams games. Yellow insert with black text, as used on some select games. Measures approx. 2-3/8 inches diameter. Includes pushbutton, lamp socket, bulb, switch, and mounting nut.